This is one big project! 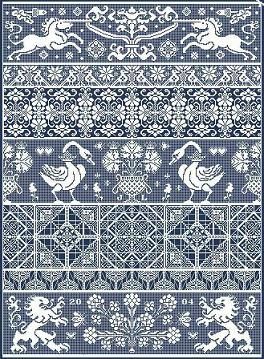 It has been inspired by the whitework samplers – sometimes called reticella samplers – which reached their peak of popularity during the reign of the English sovereign Charles I (1625 – 1649). Originally the samplers would have measured from 6″ to 12″ wide by up to a yard deep (approximately 15 cm to 31 cm by 92 cm) and featured a variety of stitches and techniques including detached buttonhole, drawn thread, cut work, needle lace and hollie point. Often the motifs and patterns would have been designs which could be incorporated into clothing such as sleeve frills, collars, cuffs and even christening gowns. Vellum or net was often used as a backing support. Bagatelle attempts to recreate the appearance of this work using only cross stitch, back stitch and just a little bit of magic too.